Figure 1: Typical base board burn. Cosmetic surgery is big business today, but our discussion here is not about facelifts or tummy tucks. We're concerned with the cosmetic touch ups we must often apply to circuit boards. While we're all familiar with reworking components, repairing pads, adding jumper wires, and the like, we have been talking about the practical application of repairing or restoring functional circuitry. What about repairs to the non-functional parts of the board? Are "cosmetic" repairs even necessary? While the subject may seem to be of minor importance, cosmetic repairs to a circuit board - such as the repair of a burnt spot or jagged hole resulting from physical damage - are indeed an important part of circuit board repair! Remember that a circuit board has value, and just because it may be enclosed in an end product such as a computer or camcorder, it does not mean that the board will never again see the light of day, to be worked on or replaced. Base board damage can open up interior laminate layers to moisture or contamination; and it's also true that many companies' quality standards and acceptance criteria include cosmetic appearance. Figure 2: Scrape away the loose material with a knife or scraper. One of the most common types of base board damage is a burn. The size, color, and layer-depth of the charred area will obviously be determined by how much heat was applied to the area and for how long. Nevertheless, the damage can be repaired and the board restored to it original integrity - and even appearance - by the following procedure. Some specialized tools are needed, and the liquid epoxy repair material can even be colored, with color agents to replicate the color of the surrounding original board material. Like a painter mixing colors from a palette, this procedure is one of the few that bring a little creativity into the process of circuit board repair. Figure 3: Grind away remaining burned material with a dental style Micro-Drill System with carbide ball mills. The first step in this repair procedure is to remove the burnt or damaged material from the area, cleaning down to the fresh, undamaged epoxy/glass board material below and around. To do this, however, one needs special tools, but these aren't difficult to find, nor are they particularly expensive. In our facility, we use a tool called the Micro-Drill. (See Figure 3) This unit is ideal for bench top milling, drilling, grinding, cutting or sanding. Unlike other hand-held drilling tools, these Micro-Drills have a tiny, high speed DC motor in the hand piece, eliminating bothersome drive cables and enhancing control. 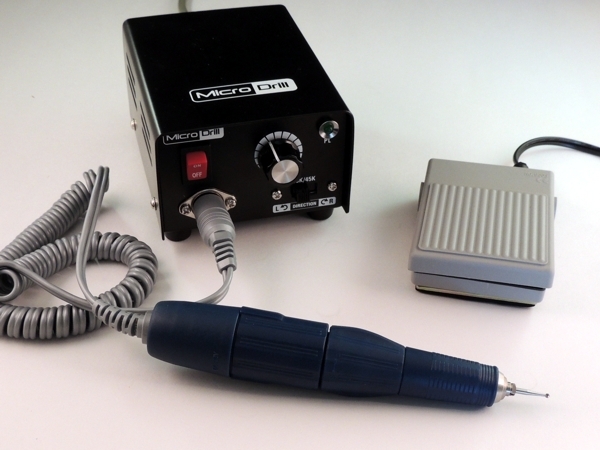 A separate power supply keeps the hand piece lightweight and reduces fatigue. These features are important when you need to maintain a light touch. We also use Ball Mills in the Micro-Drill. These ball mills are dental grade carbide steel for precision cutting and long life, with 093" diameter shanks. Carbide ball mills turning at high speed will grind away material quickly, so operator care is essential. Figure 4: A mixing stick sharpened at the end may be used to apply and spread the epoxy filler. Clean the damaged area. This means removing dust, contamination, oils, etc. 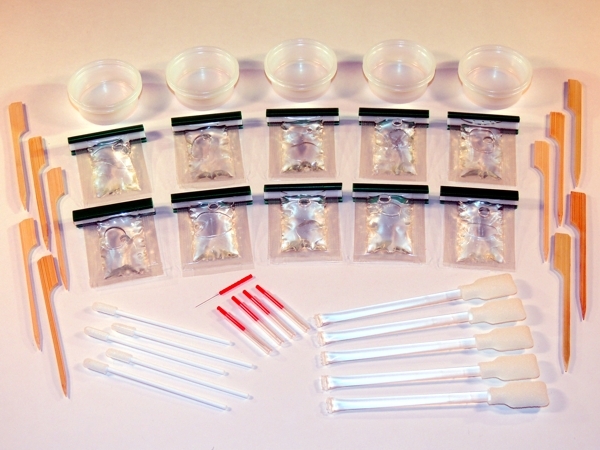 A swab saturated with solvent (IPA) should be sufficient. Scrape away loose damaged base board material using a knife or dental style scraper. (See Figure 2). All damaged base board material and solder mask must be removed at the surface. Then, mill away the damaged base board material using the Micro-Drill and ball mill. To make certain that all damaged material has been removed, flood the area with alcohol or solvent. Damaged internal fibers of the base material will show up clearly. Remove all loose material and clean the area. If needed, apply high temperature tape to protect exposed parts of the circuit board. Now it's time to fill the cavity with epoxy. You may want to preheat the board - essentially warming it up - prior to filling the area with epoxy. A preheated circuit board will allow the epoxy to flow easily and level out. Epoxy applied to an unheated circuit board may settle below the board surface as the epoxy cures, leaving a slight depression. Board repairs are best effected using clear, low viscosity, high strength epoxies. These are usually 2 component epoxies containing an activator and resin. These epoxies are available in pre-measured plastic packages, so they're easy to use, and the operator never has to measure them. The epoxy also needs a working pot life of 30 minutes or more. The coloring agent should be added while mixing the epoxy. Selection (and ordering) of coloring agents should obviously be done in advance; otherwise, it's good to have a selection on-hand. Once the epoxy and colorant is mixed, fill the area with epoxy up to and flush with the preheated circuit board surface. No fibers of laminate material should be exposed. A mixing stick sharpened at the end may be used to apply and spread the epoxy. (See Figure 4). For large areas, apply the epoxy with a foam swab to create a texture in the surface. A slight overfill of epoxy may be desired to allow for any slight shrinkage when the epoxy cures. Cure the epoxy as recommended. If needed, use a precision knife or fine scraper and scrape off any excess epoxy. Scrape until the new epoxy surface is level with the surrounding circuit board surface. Then, remove all loose material and clean the area. If some scraping was necessary, it may be advisable to mix and apply an additional thin coat of epoxy to seal any scraped areas. Finally, visually examine the repaired are for texture and color match, and apply electrical tests to conductors around the repaired area as applicable.